Seven World Class corps kicked off their second weekend of competition, as Drum Corps International returned to Muncie, Indiana's Ball State University, Friday, June 28, for its DCI Central Indiana event. The Madison Scouts took first in every scoring caption tonight, putting the corps in first place overall with a total score of 74.60. Though four tenths of a point under the score earned during the corps' last performance Wednesday night in Evansville, Ind., drum major Jaeyoon Park said he is pleased with his corps' overall progress this season. "I think our hard work is paying off," Park said. "We've put in a lot of [rehearsal] hours. It's been really great seeing the show come to life, and we're going to continue to work on it." "Our corps definitely felt the energy from the crowd, and it played a big part in our show," said Denzel Brown, who is another of Madison Scouts' drum majors. "It's probably the best performance we've had yet." A huge chunk of that energetic crowd response was courtesy of about 1,200 students, band directors and staff members involved with Music For All's 2013 Summer Symposium, which is a week-long camp for high school musicians and music educators held on the campus of Ball State University. 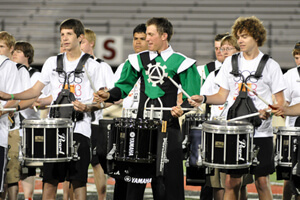 The DCI Central Indiana event is a highlight of the week of activities for the student campers. Of those attending the Symposium, the Cavaliers had the opportunity to perform with a group of 160 students following the camp's marching band track. The group spent time Friday working with the corps, which included learning a musical and marching segment of the Cavaliers' 2013 production, "Secret Society," which they performed together as an encore to close out the drum corps competition. John Meyer, a senior drum major at a Kansas City-area high school who participated in the Music For All camp said, "[The Cavaliers members] really helped put a lot of things into perspective for me on marching band and how I can be a better leader in my band." Meyer added that he plans to take what he has learned from the Cavaliers and apply it within his own marching band in the Fall, and possibly in the future as a member of a drum corps. "Drum corps is a life-changing experience, and to have these kids performing with us, getting the first taste of what it's like to be in a drum corps, is really great for the activity and great for them," third-year Cavaliers tuba player Nick Hansberry said. 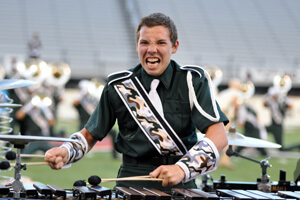 Competitively, despite an hour-long rain delay that started just as the Madison Scouts were leaving the field, the Cavaliers still exhibited a strong performance to finish in second place with a score of 72.90. Nearly three points behind the Madison Scouts on June 25 in Fairfield, Ohio, the Cavaliers narrowed the gap to 1.7 in Muncie, which is the closest the two corps have been to each other in three head-to-head meetings this summer. 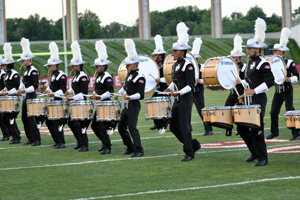 Hansberry said that the Cavaliers have been hard at work in recent rehearsals on several changes to the corps' production. "Throughout the season we go through a lot of changes, and over the past two days, we added a few things, especially in the third and second movements." Spirit of Atlanta took third place at the DCI Central Indiana event with a score of 70.80. 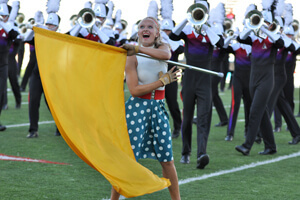 A bright spot on the score sheets for the corps was a second-place finish in the Music Analysis caption over the Cavaliers, though the corps' percussion section finished fifth behind the Troopers, Blue Stars, Cavaliers and Madison Scouts. The Blue Stars (68.40) finished fourth overall ahead of the Crossmen (5th, 67.80), who were able to hold off the surging Troopers (6th, 67.00). The Troopers bested the Crossmen for the first time this summer two days earlier in Evansville, Ind. by eight tenths of a point.